Masterson Pools & Spas has been designing and installing vinyl lined pools for customers throughout New Jersey for over 30 years. No longer restricted to basic geometric shapes, vinyl lined pools provide a more economic choice without sacrificing quality. Liners are available in an extensive array of vibrant colors and designs, from your basic rectangle, to your custom shaped swimming pool. 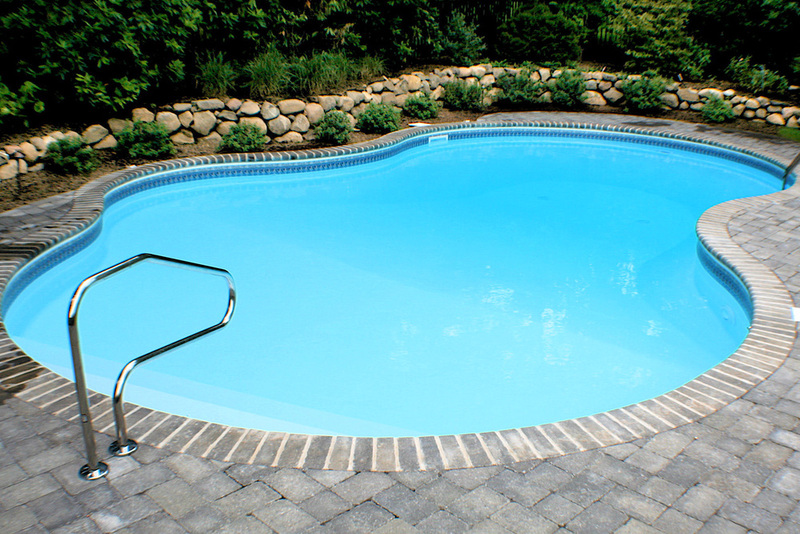 As part of your pool design, our skilled craftsmen also offer a multitude of add-ons including stamped concrete, custom stone work, and other construction services. The stairs to a swimming pool are no longer the only entry or exit from the pool. Popular among today's clients are deep end swim outs and benches. Recessed from the contour of the deep end wall, these features provide egress from the pool and provide additional in water seating. In addition to the convenience they provide these options eliminate the need for unsightly stainless steel ladders. A swim out will make your new pool safer and more comfortable for yeas to come. In recent years, a feature that was once solely available to concrete pools, has become a viable and attractive option among vinyl pool customers. Enjoy the serene sound of cascading water while lounging by your pool after a long day of work.